Chocolate Fountains serve melted chocolate by running it continuously from a reservoir at the bottom of the fountain to the top from where it cascades down like waterfall of chocolatey goo. The fountains are largely ornamental and are used most often as a centerpiece of a buffet table or dinner table, usually at special occasions such as wedding receptions. In addition to being ornamental, and giving any gathering the appearance of being a fancy catered affair, chocolate fountains are used to dip food like a fondue. Typically cherries, strawberries or marshmallows will be dipped in the chocolate fountain and eaten. 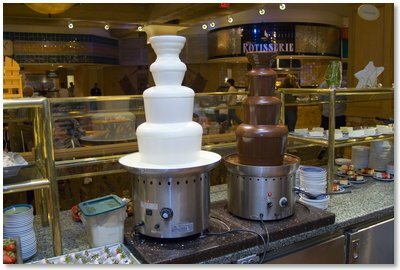 The chocolate fountain holds up to 2 pounds of chocolate. It is a great centerpiece for parties and holiday get togethers. Your guests will love to dip strawberries and other fruit or even marshmallows in this delicious chocolate fountain. The nice thing about this chocolate fountain is that it is stainless steel, which makes it more durable. Plus it has dishwasher safe parts to make it easier to clean after use. I like the retro style of this chocolate fountain.